Disclosure: some of the links below are affiliate links, which means that, at no additional cost to you, I will get a small commission for purchases you make through the link. But first… What is purple crying? Okay, so calling it “purple” crying does not mean your kid is screaming until they turn purple. It’s actually just an acronym. Unfortunately, I didn’t hear this acronym until after my third child had already gone through this stage. It would have been really helpful to know up front! So let’s break this down a little further. Purple crying tends to start around six weeks of age and last until about three or four months. When you’re in the middle of it, that sounds like a really long haul. But the main point here is, purple crying is a developmental stage, just like tantrums in toddlers or moodiness in teenagers. You’re not doing anything wrong, your baby is just growing up. Purple crying, starting around six weeks and lasting until three months, is a normal developmental stage. There’s no real “reason” for the crying. Your child isn’t hurt, he’s been fed, changed, and burped. But he still won’t stop crying. It’s weird, because he was fine during the day, but once evening rolls in, everything falls apart. No matter what you do, your baby still cries. You rock, you bounce, you sway, you feed, you sing, you try everything. It can be really stressful! A lot of times in this stage, it looks like your baby is in pain during these crying bouts. People will tell you your baby has gas, or you’ve fed him too much, or not enough, or something. But none of those things may be true. This crying will often last for hours. I remember my oldest would fuss from probably 6-9 at night, finally go to sleep, and then wake up and cry for an hour or two in the middle of the night. Granted, I don’t remember much of this stage because I was exhausted, but I do remember dancing with her in the dark and humming snatches of songs from Ocarina of Time (okay, fine, I’m a Zelda geek). As I mentioned, this crying usually starts somewhere between 5:30 and 6:30 at night. So if you’ve gone back to work and are coming home to this, it can be especially draining. What do you do for purple crying? The short answer is just get through it. 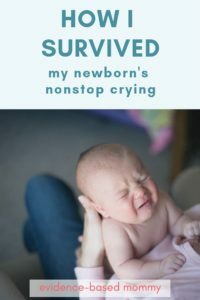 But of course, I have several tips here to help (as well as the big realization I had that changed everything about purple crying with my third child). Ugh, no one even wants to talk about this, do they? I feel sick to my stomach just bringing it up. But this discussion could save a child’s life, so I feel compelled to mention it. Shaken baby syndrome is a real thing. You may ask yourself, What sort of monster would do that? But the scary answer is, it’s not mean, evil parents who do this. It’s desperate, overwhelmed parents. People who have done everything they can to make the baby stop crying and it just won’t. Sometimes otherwise good parents can just absolutely lose it, and that’s when shaken baby happens. Bottom line: If you’re feeling like over-the-edge frustrated with your baby, put her down and walk away. At that point, it’s okay if she’s still crying. Call someone and get help right then. If you need to cry, scream, whatever it takes to let the frustration out, that’s better than accidentally losing control with your child. I know, I know. You have a newborn who screams at you for hours every night. How do you take care of yourself? But seriously. Purple crying is such a draining stage. You have to have emotional reserves to be able to deal with it. Let someone else hold the baby while you go take a shower all by yourself. And during that shower, don’t worry about anything other than how nice it feels to have hot water running over you and to be clean. Drop any other agenda entirely. Go to bed at eight at night if you need to. Sleep deprivation makes such a huge difference in your ability to handle stress. Trust me, I’ve seen what happens when I’m running on no sleep taking care of a newborn. It isn’t pretty. And give yourself empowering messages. Seriously, telling yourself that you are capable of remaining calm in a situation like this can make all the difference. Want free access to short but powerful statements that can strengthen you? Sign up for my free printable mantra set, designed specifically for moms! Cut out the sayings and place them throughout your house in the rooms and areas you’re most likely to need them. Get your empowering mantras here! This is especially true if you’re breastfeeding. Your baby will likely be fussy and want to nurse a lot. Let her. And no, nothing is wrong with your supply. Breastfeeding and the close contact it provides, not to mention the oxytocin it releases, is as much about emotional nourishment as it is about physical nourishment. But if you are worried about whether your breastfeeding baby is getting enough to eat, I have a short, simple list of ways to know for sure that your baby isn’t going hungry. You can grab yours here! Having a wrap to carry your baby in makes such a huge difference. Your arms will get much less tired while bouncing and swaying your baby if you have a wrap to help support him. One day soon I’m going to do a whole post on baby wraps (I’m obsessed) (EDIT: Here’s the article on baby carriers! ), but for now I’ll just mention the two styles I like most for newborns. 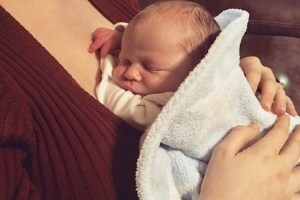 First is my favorite for newborns, the Boba wrap. This is a stretchy style wrap that you can tie on yourself and then pop your baby in and out of without having to redo the tie every time. I have memories of all three of my little ones snuggling up and falling asleep against me in their wrap. And yes, I know there are other brands of stretchy wraps that you can buy easily in local stores, but the reason I like Boba the best is because they are not nearly as hot as other brands I’ve tried. And trust me, we lived in Georgia for the first year of our oldest baby’s life, so I know what it’s like to be in hot weather with a stretchy wrap. I’ve found that the Boba holds its stretch a little better too, making it a little easier to use. Yes, accept that casserole from your friend! Let your sister-in-law come do laundry for you! Whatever help someone offers, take it. And if you’ve been given a vague “Let me know if I can help!” from people, take them seriously and direct them to what you actually need from them. Do you need someone else to hold the baby because you just can’t take the crying anymore? That’s okay! Give the baby to your partner or your mom or whomever (okay, not just anyone, but you get the idea) and just go for a walk. At the same time, well-meaning family and friends can sometimes be the biggest source of your self-doubt as a parent. He’s gassy. What did you eat? You’re feeding him too much. You just need to put him down and let him learn to self-soothe. Are you sure he’s getting anything when he’s on there? Maybe he’s allergic to your milk! All these comments are excellent opportunities for you to practice the smile-and-nod approach to parenting. You’re doing fine, and your baby is fine. He is just going through a developmental stage. Your job is not to make your baby stop crying. Your job is to help your child get through the crying. I think what stresses us out the most about the relentless crying is that we take it to mean we’ve failed somehow. But that’s not the case. Your baby is simply crying because he’s going through a normal developmental stage. What stresses us most about relentless newborn crying is that we take it to mean we've failed. But that's false. Should you leave your baby alone through this transition? Of course not! (Unless you’re about to completely lose it and are afraid you could accidentally hurt your child. If so, put her down, get some help, and go somewhere to cool off). Your calm, loving presence, letting your baby know that he’s acceptable even when he’s upset, will make a difference. Think about yourself: When you’re really upset, do you want someone to offer solutions and try to “fix” the problem, or just to be there with you and help you weather the storm? It’s the same for your baby. Your calm, loving presence during your baby's crying does make a difference. And as your child grows, the practice you get here, of being with him when there are no easy answers, will be invaluable later. Because I know the days of heartache with no easy answers are coming. So use this perspective shift to help you through the weeks of purple crying. Yes, it’s hard, but it’s just a (normal, healthy) stage. Practice your own emotional self-regulation, and in turn, you’ll be the first model of this important skill that your child will see. A lot of helpful information here! I’m hoping that me and my boyfriend are going to get serious soon and this is one avenue that I’ve been scared about the most. The encouragement and resources you provide here makes it seem a lot less daunting. Thank you! You’re so welcome! That’s the biggest thing: remembering that your only job is to be present with your child, not to “fix” the problem. You got this! Of course you’re welcome to!